I love fresh-baked chocolate chip cookies. (Oh, who am I kidding? I love just about any fresh-baked dessert!) But, I must admit, I really don't like to bake cookies. I hate having to stand around and wait for each individual tray to bake and in the process, giving up an hour or two of my time to get them all done. That's why I absolutely LOVE bar cookies. The entire batch gets done all at the same time. I just set the timer and pull them out of the oven when they're done. No standing around necessary! 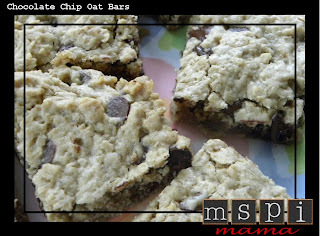 I saw this recipe over at Food Allergy Mama a while back and just knew I had to make them. Quick and easy -- they turned out great. The oatmeal makes them nice and chewy. Yum! Preheat oven to 350 degrees. Line a 9-inch pan with foil and coat with baking spray. In a mixer, combine the shortening, brown sugar, vanilla and applesauce. In a separate medium bowl, combine the flour, baking soda and salt with a wire whisk. Add to shortening mixture. Stir in oats and chips. Spread mixture into prepared baking dish and bake for 30 minutes or until lightly browned on top. Cool slightly and cut into bars. Tip: Don't have applesauce on hand? Use one egg instead. what brand of choc chips do you use? Thanks so much for your website- still nursing mspi baby at 10 months- he is thriving- thanks in part to your yummy blog! These were great! I made them with vegan butter and whole foods chocolate chips. I didn't have anything but quick oats, but that seemed to work. I cut them up, wrapped them individually, and froze them and I slip one into my lunch bag every day. I appreciate this recipe alot! YUM! I just discovered your blog today... 19 days before we get to test dairy on my almost-1-year-old. Still, I'm milk-free (and soy for awhile yet) 'til then and these are mighty tasty. I also use the vegan Whole Foods 365 chocolate chips and used old fashioned oats as those are the only kind I have. My husband is licking his plate as I type this. Success! These were great. My first attempt at baking dairy & soy free. My only comment would increase the amounts by 50% so that the bars are a little thicker. It is so great to have dessert again! Yum, yum, yum! Another recipe I've made a few times already! I like to use the excuse of "the oatmeal helps my milk supply" so that I can eat most of these myself. I made more today, but was low on chocolate chips, so I added some cocoa powder and some coconut. Pretty good! super yum, but a smidge too crumbly/dry. Could be from using rice flour instead of wheat, but I used guar gum to thicken. Might try more shortening (used Mother's margarine--MSPI-friendly) or applesauce next time. Is there any reason why quick cooking oats would work better than old fashioned oats? These look perfect!! You can try using old fashioned oats. The bars will likely turn out chewier and the texture a little different, but the flavor will and overall bars will likely be the same. If you want, you can pulse old fashioned oats in a blender to create quick cooking oats.